Can you think of better ways to spend your time?!? UPPER DARBY, Pa., Jan. 24 For the math-challenged, remembering pi equals 3.14 is tough; now a Pennsylvania man has memorized pi to 12,887 digits. Mark Umile, 40, a fling clerk from Upper Darby, figured the problem by hand, writing down the results 1,000 digits at a time -- and then memorized the number, the Philadelphia Inquirer reported. I was really proud of him that he did it, his wife, Maryann, said. I can't remember a phone number.The world record for figuring pi is 67,890 digits and was set in China, but Umile's feat eclipsed the old North American record of 10,980., the Inquirer said. Umile, however, does hold the record for memorizing 905 digits of the mathematical constant e and the first 5,544 digits of the square root of two, the Inquirer said. KUALA LUMPUR, Jan 26 (Reuters Life!) 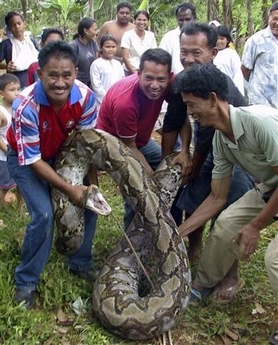 - Guard dogs protecting a fruit orchard in Malaysia have met their match -- a 7.1-metre-long (23-ft-long) python that swallowed at least 11 hounds before it was finally discovered by villagers. "I was shocked to see such a huge python," orchard-keeper Ali Yusof told the New Straits Times in an article published beneath a picture of the captured snake, which was almost long enough to span the width of a tennis court and as thick as a tree trunk. Villagers did not harm the snake, which was tied to a tree then handed to wildlife officials, the paper said on Friday.